One thing the Internet never runs out of is cat photos. Every time we think we’ve seen it all, a new variation on the cat photo once again comes along to brighten our days. If you’re at all like us, you probably just can’t get enough of them. 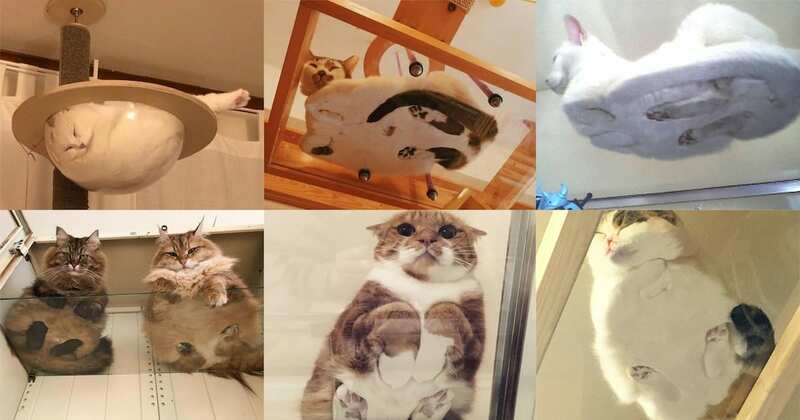 That’s why when we saw this collection of pictures of cats sitting on glass tables, we decided it was something we just had to share! 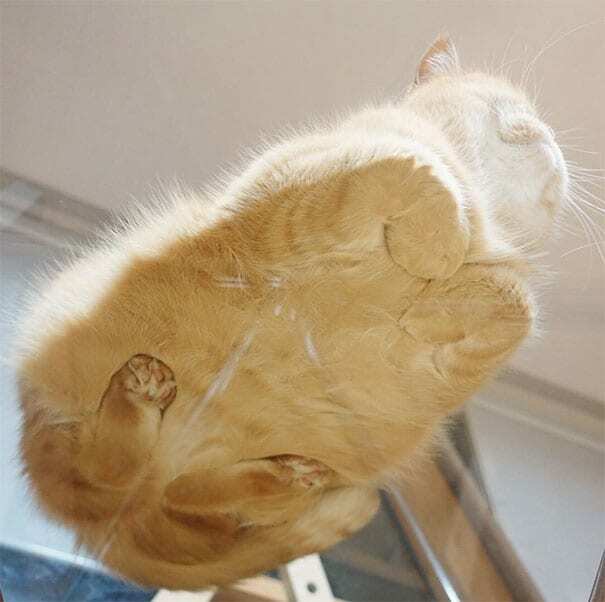 While some of these cute furballs look like catships, others are more just like blobs of liquid cat. The one unifying factor, however, is that they are all absolutely hilarious. So, stop whatever you are doing right now, take a break from working for a little bit, and check out this awesome slideshow we’ve prepared for you. Just make sure to put your drinks down first, because we guarantee you are going to laugh. This hilarious cat looks just like a loaf of bread. The little feet are all totally compacted into a perfect baguette. Those puffy cheeks are pretty funny, too! 2. Every Step You Take Every Bag You Shake Every Fish You Bake I’ll Be Watching You! Watch out, Rexie the cat is giving us the stare down! It’s hard to be afraid of him though. He is just too adorable. According to his owner on Instagram, Rexie is also a handicat (handicapped cat). He was born with a disability that causes him to have only two working feet. 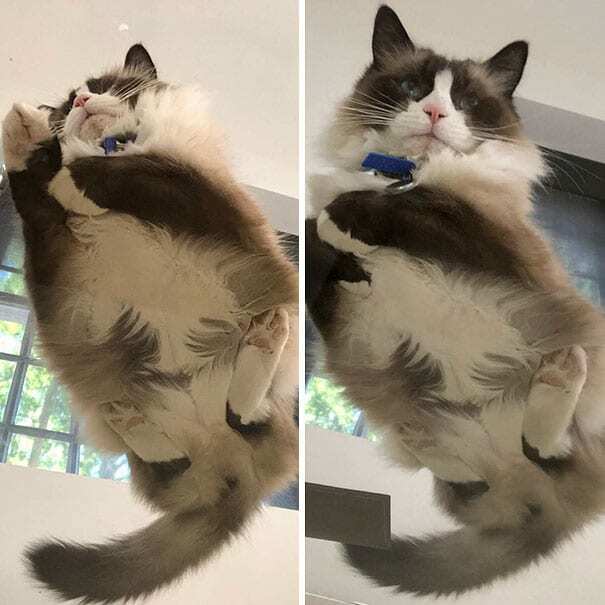 The fat floof on this chub cat is incredible. We also love the double chin it has got going. It looks like the owner didn’t realize their iPhone was reflecting off the glass when taking the photo though! 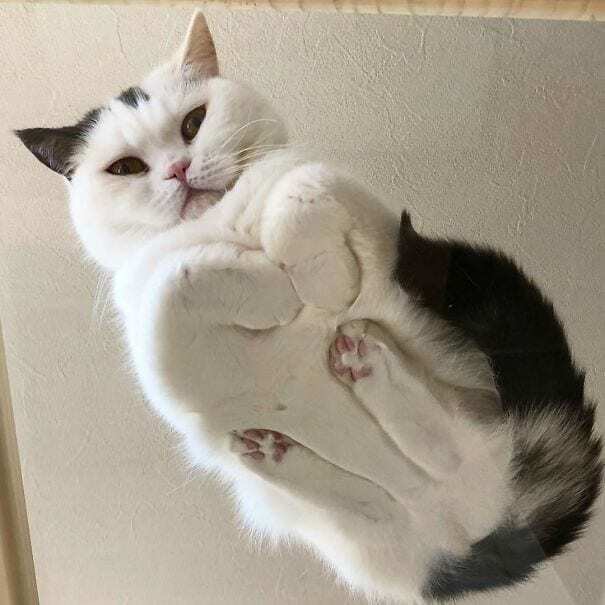 A cat chilling on a glass ceiling. Nice! If we were to wake up and see this, we might even mistake it for an alien catship. One user on Reddit called its feet “retractable landing gear”. Scout is basically curled up into a total furball. If you weren’t paying close attention, you might not even realize you were looking at a cat. The slight reflection from the table adds a whole new dimension to the image as well. 6. 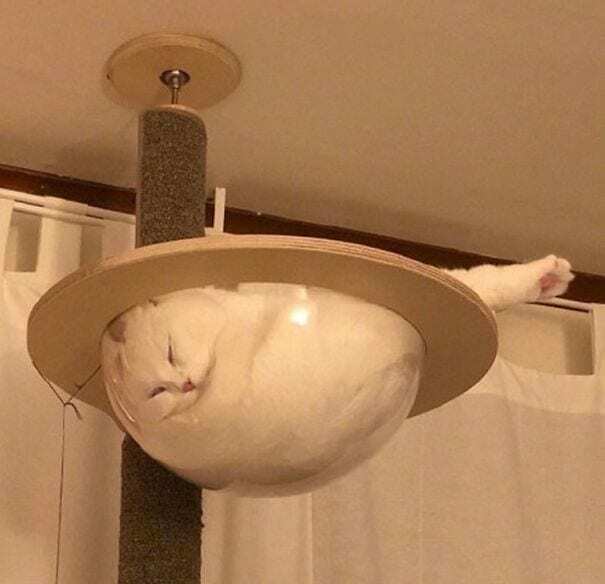 Glass Bowl Of A Cat! There is no way this position can actually be comfortable! The cat appears to be sound asleep though, complete with one paw randomly hanging out of the bowl that wasn’t able to fit in. 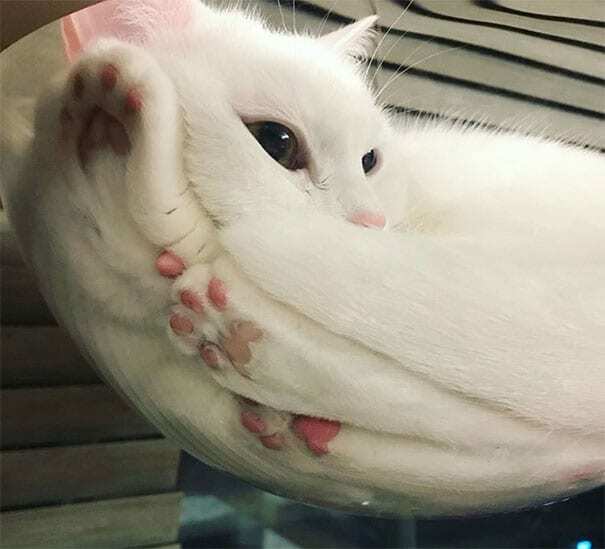 Yet, the real mystery is not how the cat can fit into the bowl, but how can it can breathe like that. Meow! This cat is doing a really beautiful pose for us. 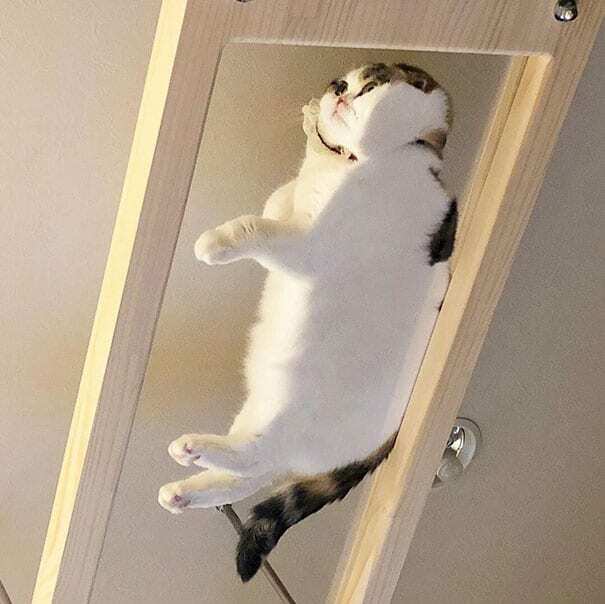 The way the angle of the shot is taken, it appears as though the cat could basically fall through the glass at any moment. It is literally sitting on air. 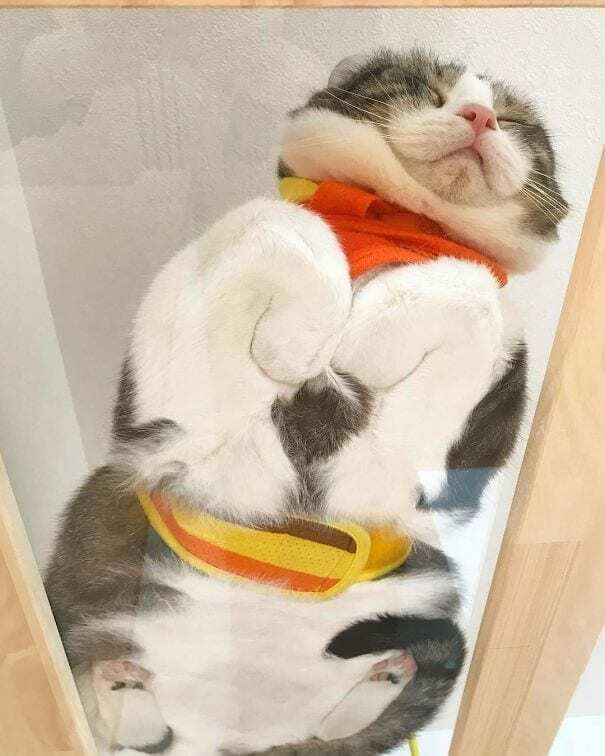 This picture of Mikan the Japanese cat laying completely flat against the glass is super adorable. We are absolutely in love with that white fur. The little table is essentially the perfect size for Mikan, too! This Sphinx cat is licking up a delicious coconut oil treat, completely oblivious to the fact that she is being filmed. 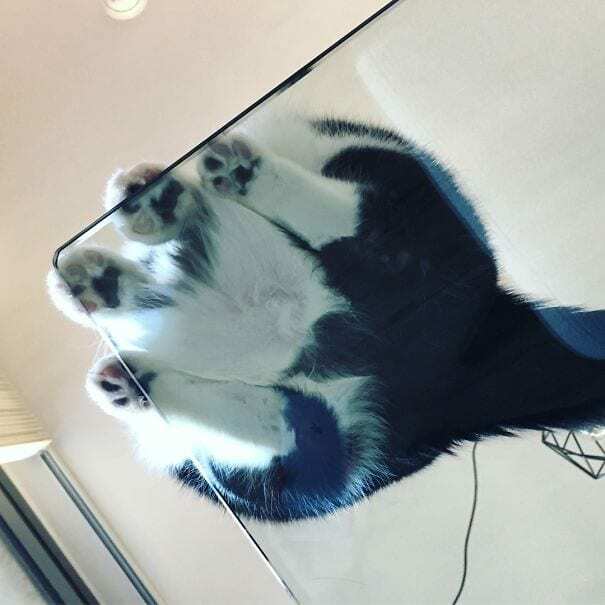 The glass table provides us with a whole new perspective of how cats eat. It gives us the perfect angle of her face to see how much she is really enjoying it. Here we have another great photo of the handicat, Rexie. In this one, it appears as though he is totally mocking us, tongue out and everything. “I bet you wish you were a cat,” he is likely thinking. His owner describes him as a “living emoji cat” and we tend to agree. That’s it! We are totally adopting this cute kitty. Hopefully the owner will let us? It’s pretty amazing, really. There is just so much fluffiness all squished together in these two photos. 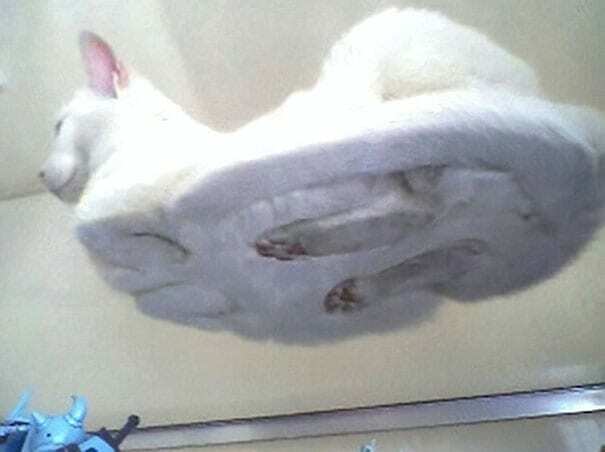 Finally, a picture of the original classic hover cat! This one has been making the rounds on the Internet for a while now. 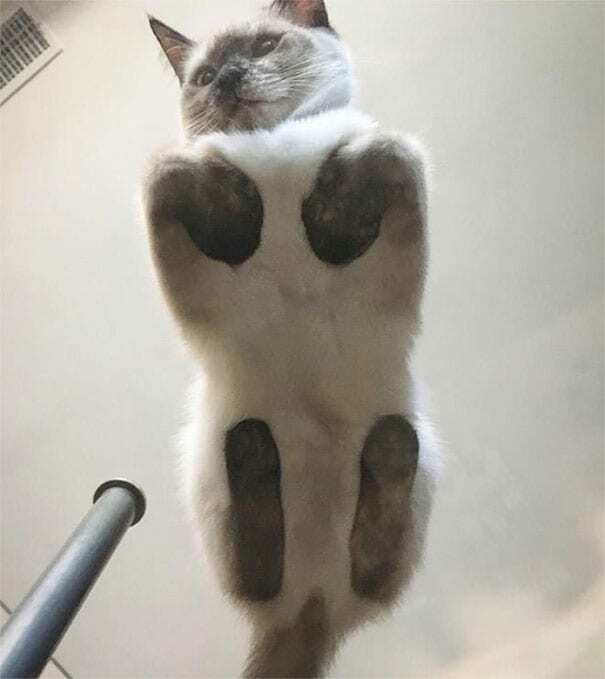 The true source of the photo is unknown, but we imagine this cat and owner are likely from a galaxy far, far away. 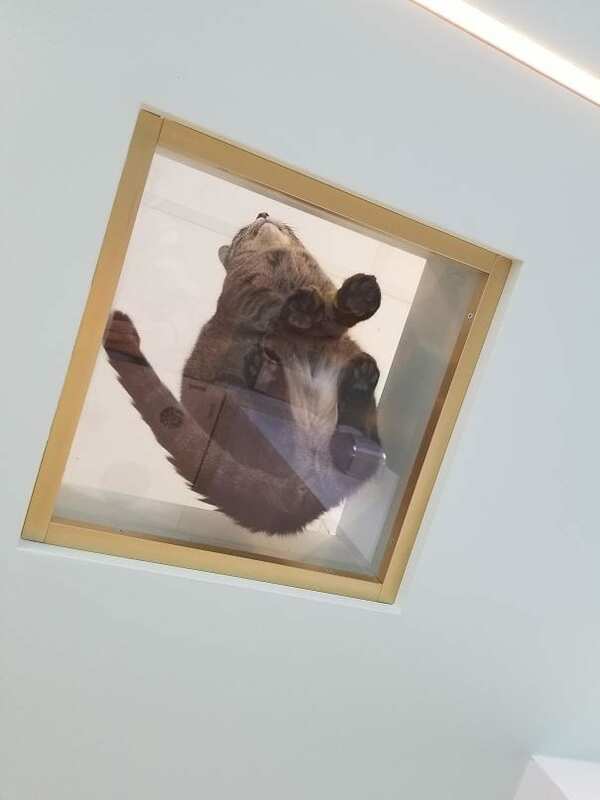 This chunky little cat is chillin’ on the roof of the cat cafe and lovin’ it. What a life. We hope it doesn’t break the glass though. Wouldn’t that be something? It’s raining cats! 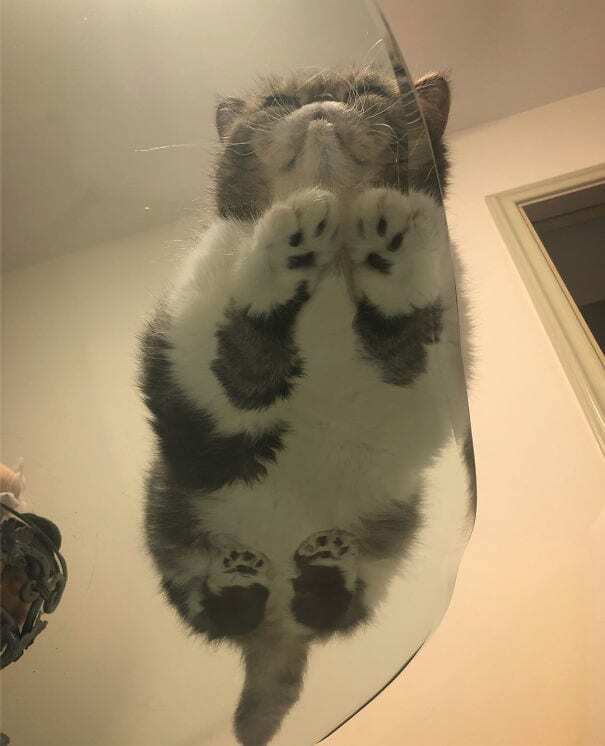 Look at the toebeans on this one! 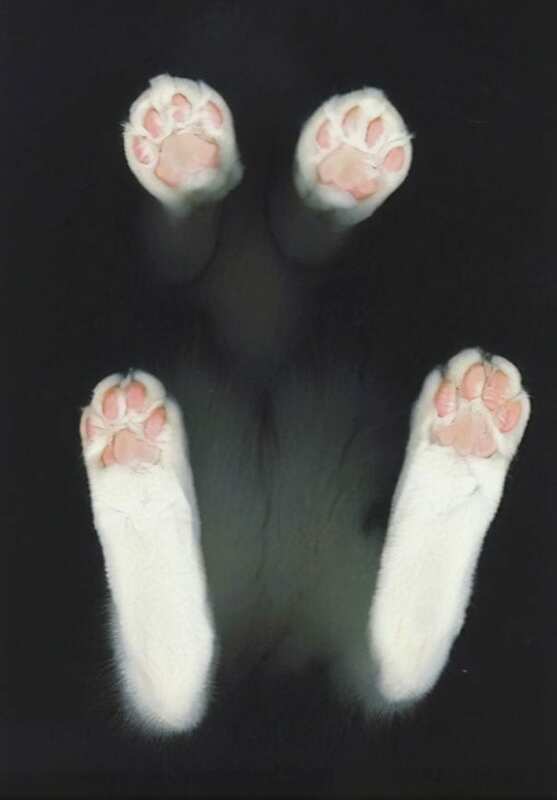 Since the shot is very dark, all we can really see are the cat’s paws balancing it on the glass table top. It is a pretty fun image to look at. 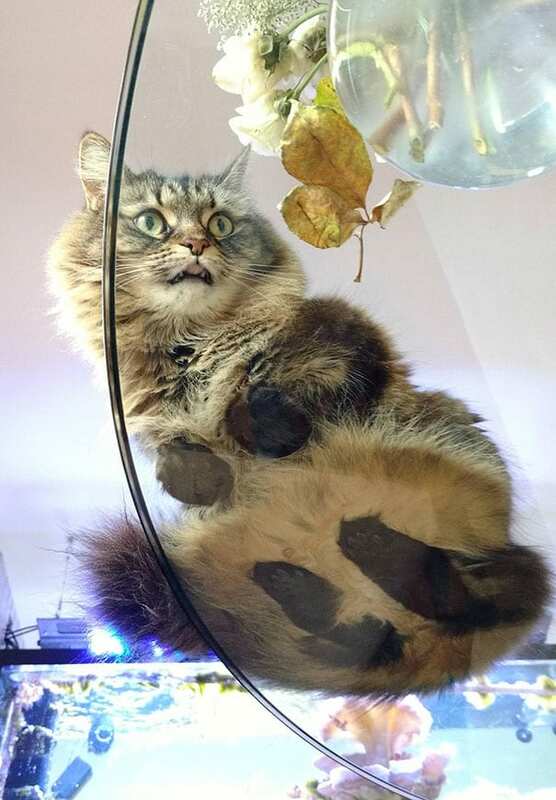 This cat was just having a nice relaxing day sitting on the glass table until their owner came along and had to turn the moment into a photo shoot. The puzzled cat can be seen looking down through the glass at the camera like, “why are you taking pictures of me, human!” Of course, the Internet definitely appreciates the cat’s patience. Check out this fluffy kitten. Squished against the glass with all that fur like that you could almost mistake it for a hamster. The tail is a dead giveaway though. If anyone is a Dr. Seuss fan, this cat might look familiar. That’s because it looks exactly like the Lorax! 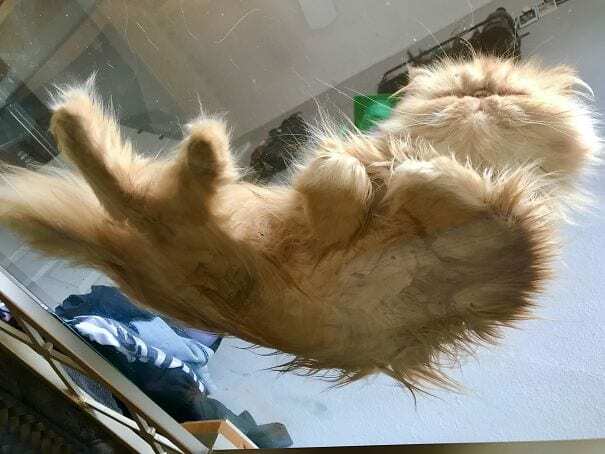 Splayed out on the glass table with fur flying everywhere, it really has no shame. It’s just sitting there mean muggin’ with its nice, smug, flat face. 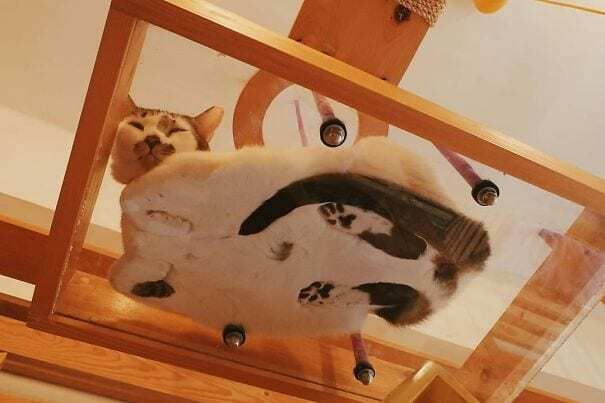 “What are you doing underneath the table, silly human! ?” At least we imagine that’s what this kitten is thinking. 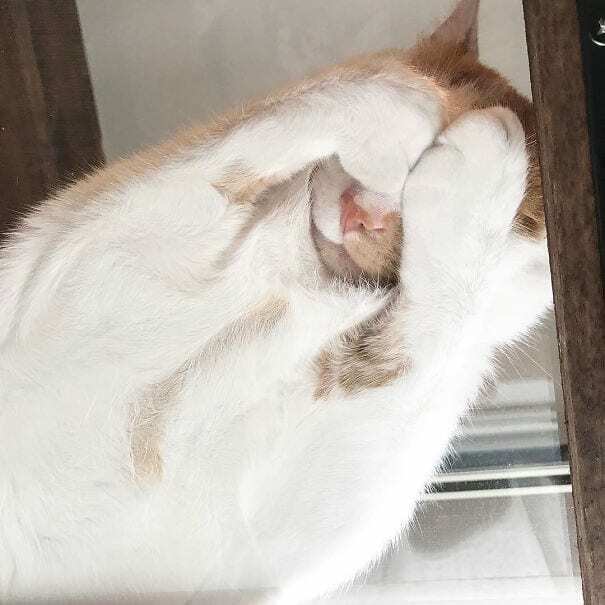 Regardless of what’s going through its mind, though, if one thing is for sure, it’s that this cat is extremely adorable. What the heck. 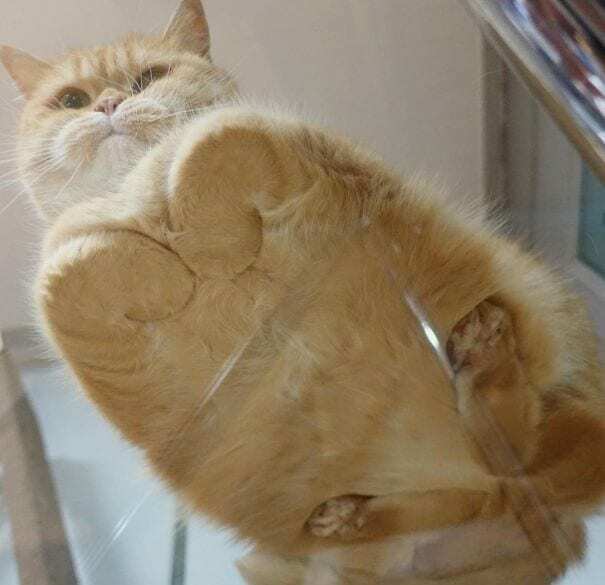 Another cat on glass? We’re starting to thinking this is a thing. Oh, wait… that’s because it is. Basically, the best thing ever in fact! 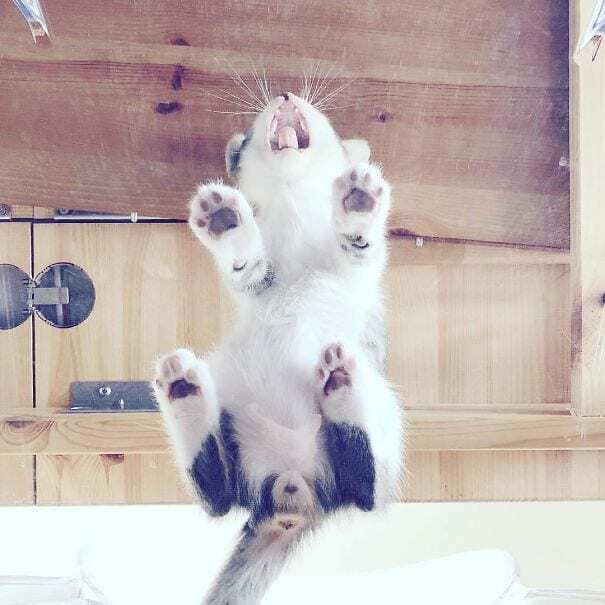 This cuddly kitten is dying for a bite to eat, but sadly it is stuck on the other side of the glass. We understand the struggle and do admit you have most adorable sad cat eyes, but sorry cat! You’re just going to have to wait until dinner time. This energetic cat is definitely ready to party, or should we say pawty! How can we tell? That wide open jaw, of course. We’ll never know for sure, but in the background we imagine there is some raging music playing. 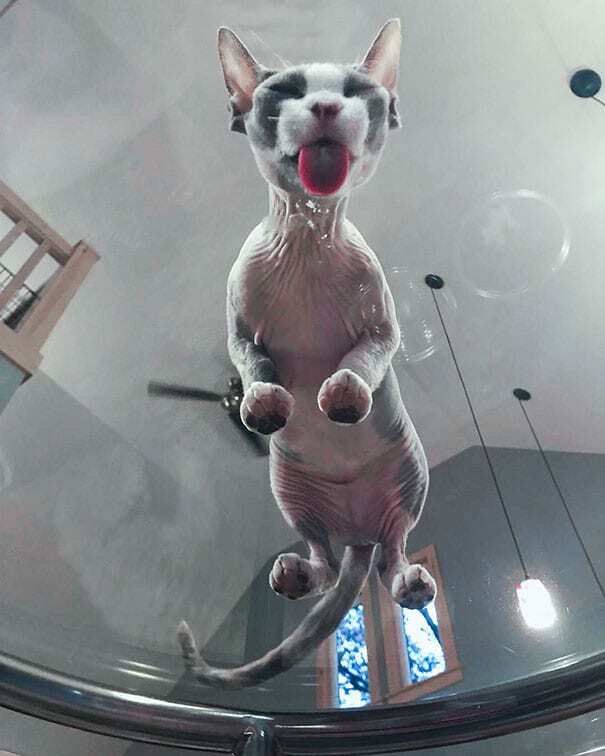 The cat is happy to sing along, dancing the night away out on the glass. Be like water, my furry friend. 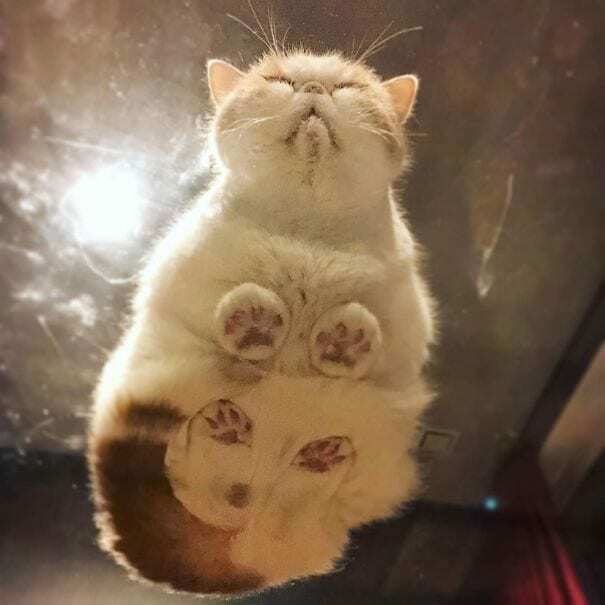 All melted into a glass bowl like that, it’s likely the aspiring yogis out there could probably learn a thing or two from this liquid cat. It definitely knows how to relax, at least. 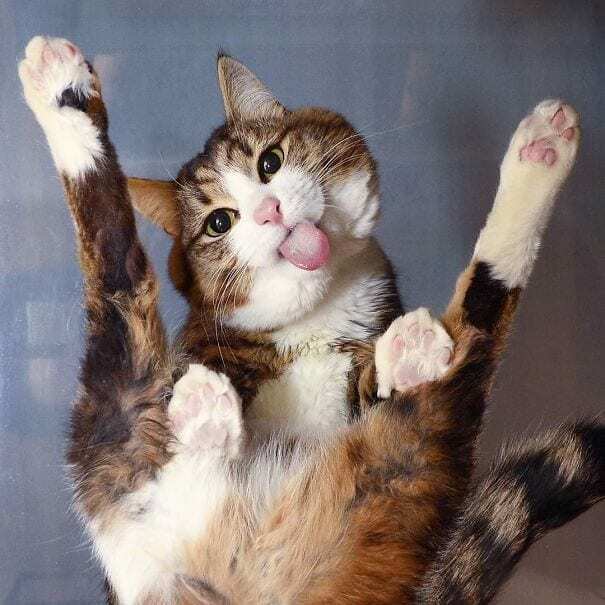 The owner of this goofball cat titled the photo pretty funny, but it is, in fact, a very accurate description. She is definitely quite the catloaf, and today we are getting an up close and personal look. 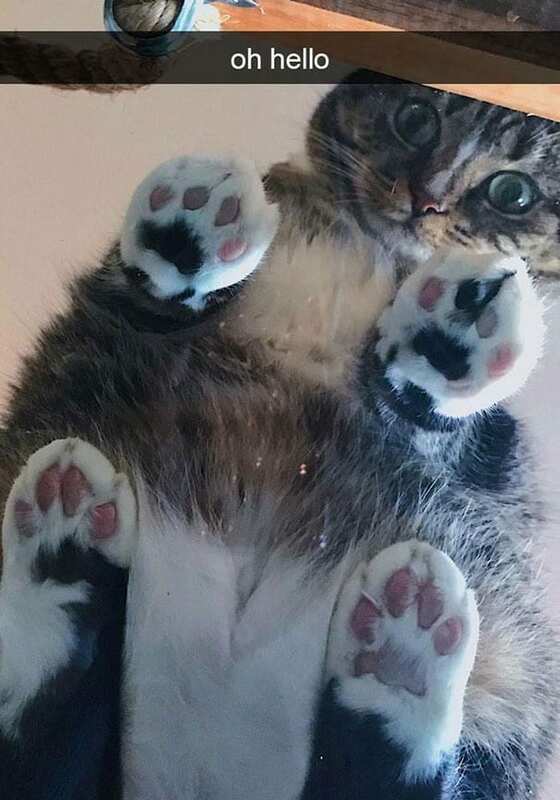 Those jelly bean paws are totally smashed into her body. 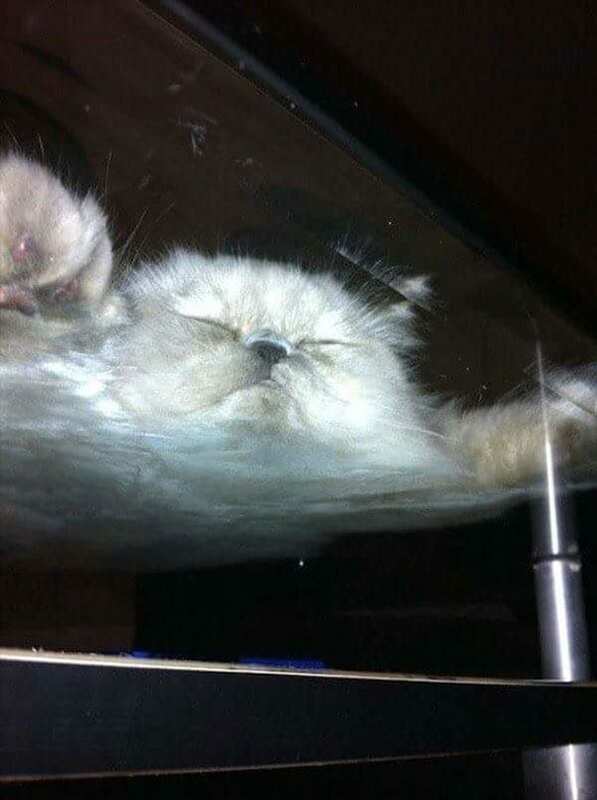 The only problem with sleeping on a glass table is that it’s too easy for the light to interrupt your zzz’s. Instead of moving someplace else to take a nap though, this cat has figured out a better solution. It just covers its eyes with its little paws. When you are a cat, there is really nothing more fascinating than a bunch of flowers in a glass vase. What a life, being a cat. You just get to hang out and derp around all day. We’re curious what will happen when it sees the fish tank behind it! 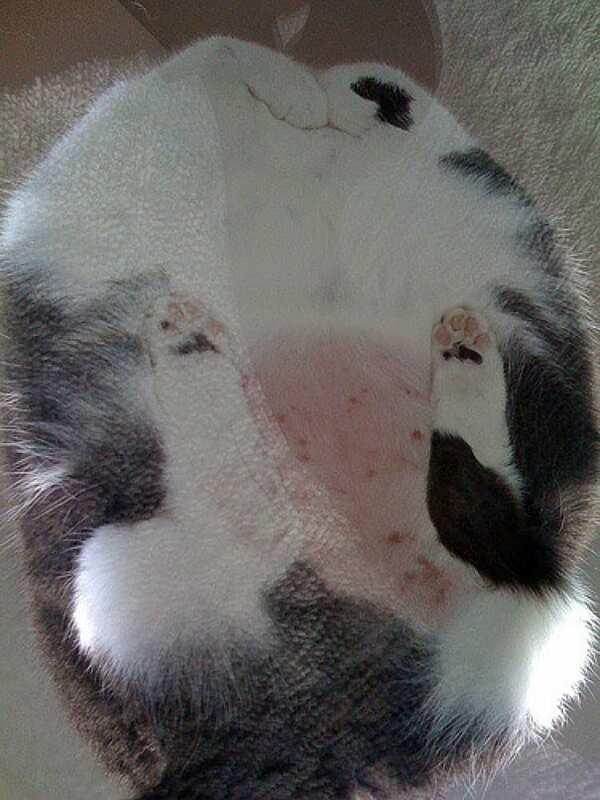 These cute cats have to be related, although one is definitely a little pudgier than the other. 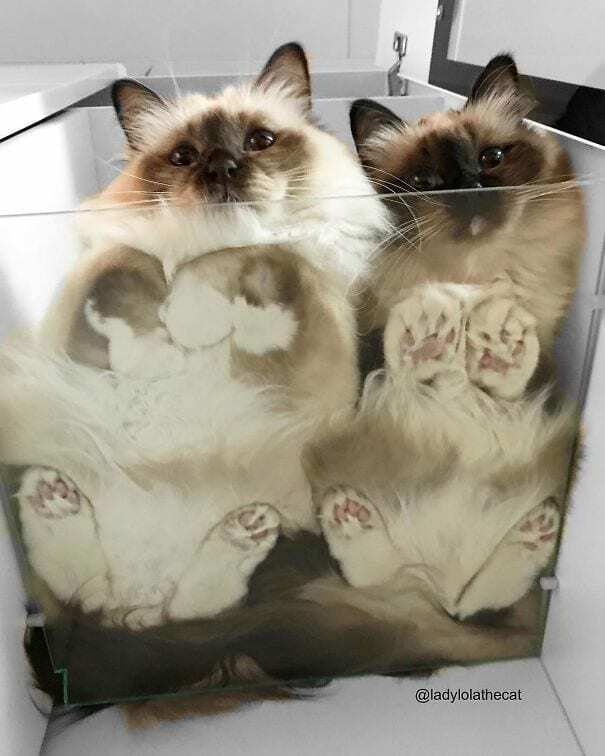 Packed together inside the small compartment of a glass shelf, the combination of the pair staring down at us is absolutely adorable. They certainly look like they are having fun! We’re confused.. who titled this one? According to the Internet and other commenters at least, there is definitely no glass table in this photo. 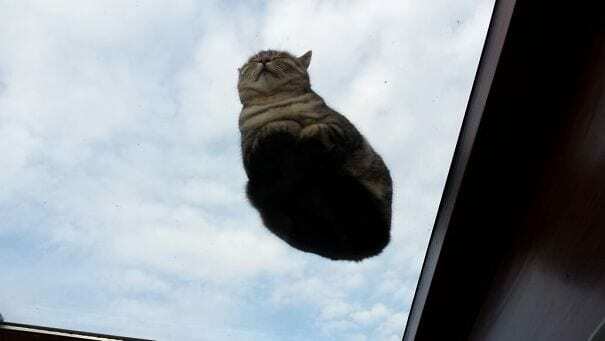 The magic cat is simply floating in the air, going for an invisible magic carpet ride. Maybe it is controlled by the antenna that is coming out of it in the background? 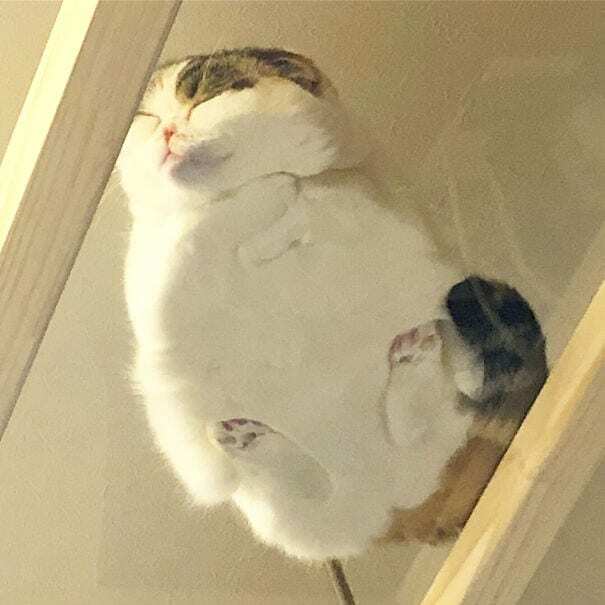 Is this a cat or a cloud? We can’t tell. 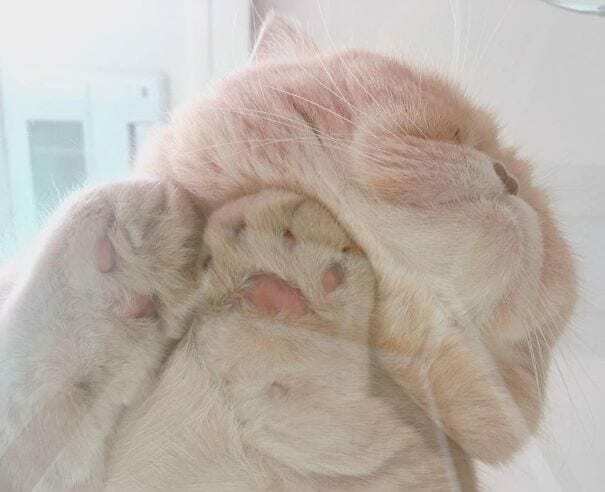 Spread out and melted up against the glass, this little furball is sound asleep and totally passed out. How do cats end up in positions like this? This hungry cat is on the lookout for food and the crafty feline is definitely being smart about it. Really, there’s no better way to scope out a scene than from high up in the air peering down through the sunroof. From its current position, it is completely untouchable. All it is has left to do now is to wait for the right moment to make the move. 31. 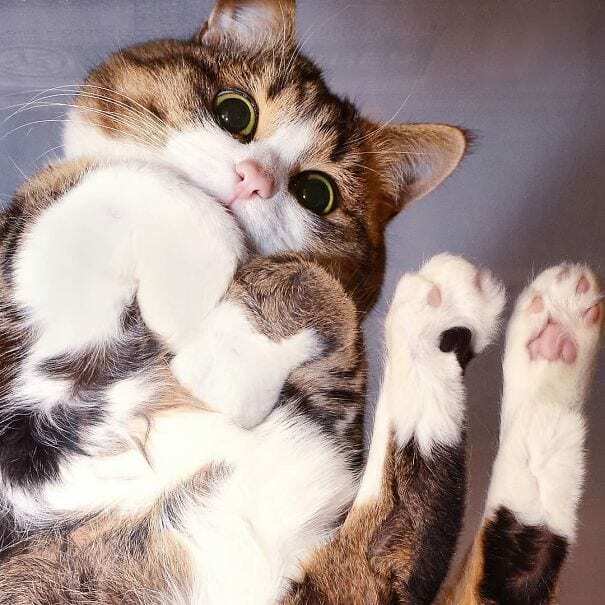 Did You Just Say I Have A Double Chin? Aww this kitten is super cute! 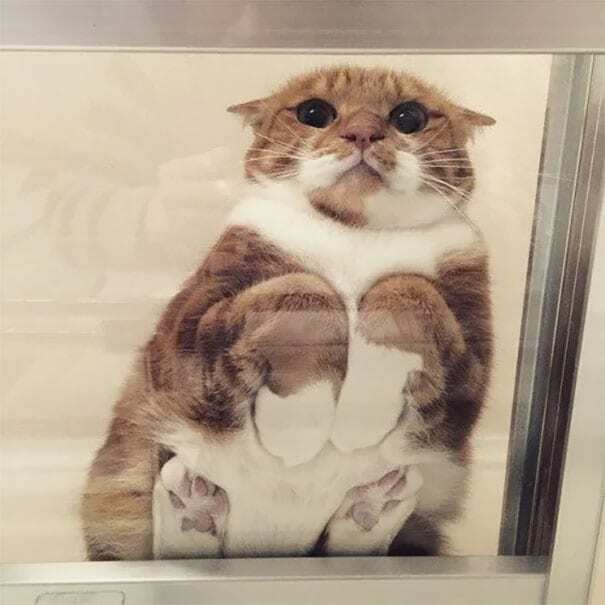 The paws are all scrunched up into a heart shape, and with its mug pushed up against the glass it even looks like it has got a little double chin going. All it takes is a quick glance at that relaxed face to tell how content it is. 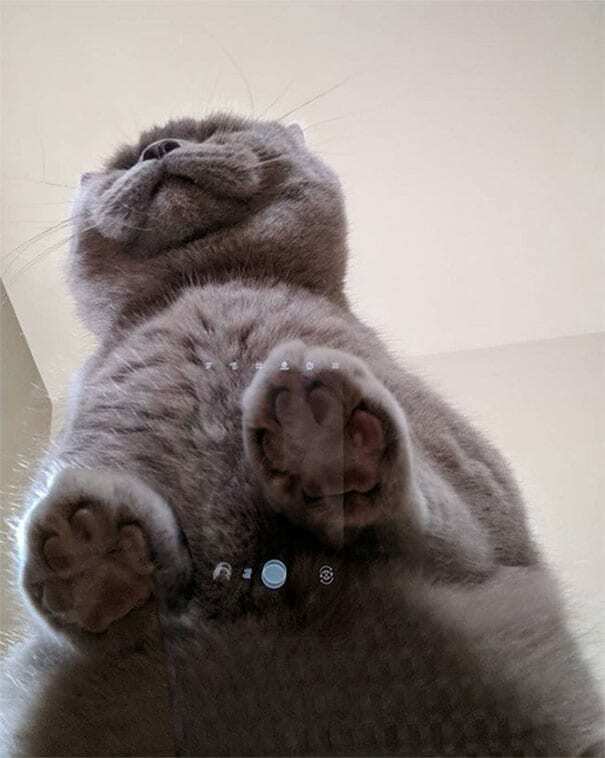 This one has all of its paws totally smashed together, making for the perfect jellybean picture. 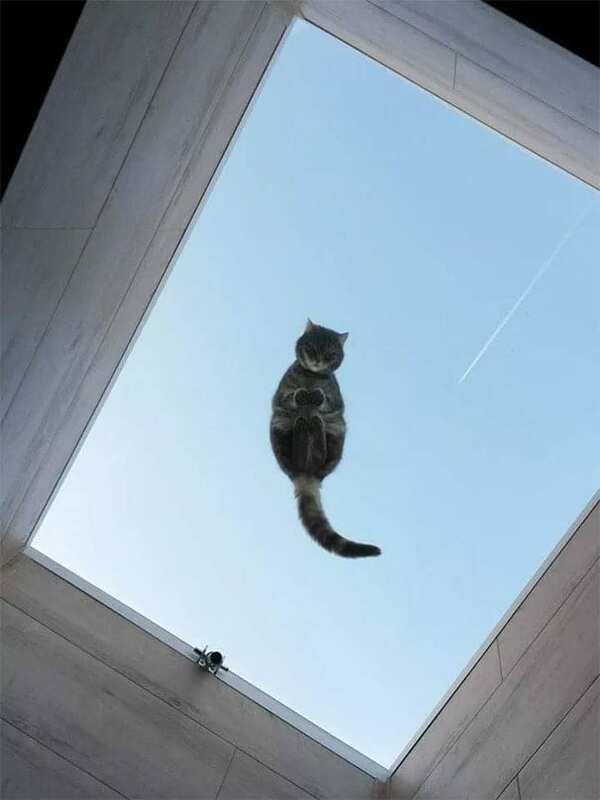 The cat is majestically poised, looking out across the horizon to see what’s going on. The only real question we have is where is the tail? Wow, this cat is not afraid to put it out there. It’s all about showing off that little cat booty, no shame about it. What a wonderful and fantastic view! 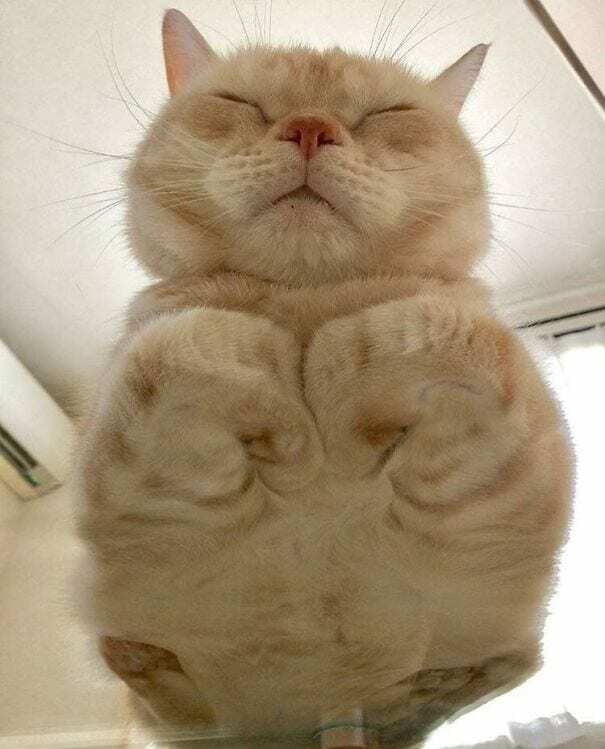 Squishy Boi is certainly one of the cooler cats we’ve seen and he’s loafing on his paws just like a true catloaf. He is just so comfy and fluffy! Although he looks innocent on the surface, with a name like that he’s definitely a little suspect. 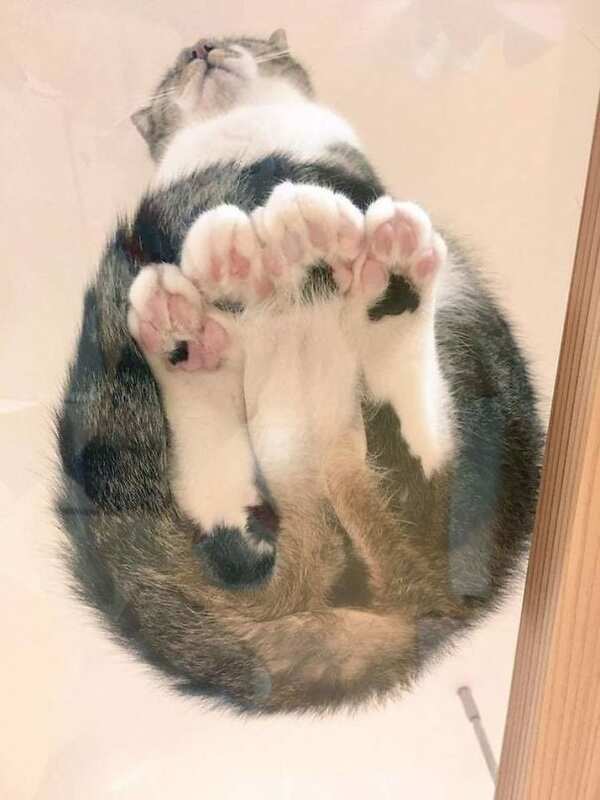 Check out this awesome fur baby, chilling and pressing its beans into the glass without a care in the world. It is certainly quite an excellent specimen. One user on Reddit had a very interesting way to describe it. “It looks like an elderly Japanese man,” they said. 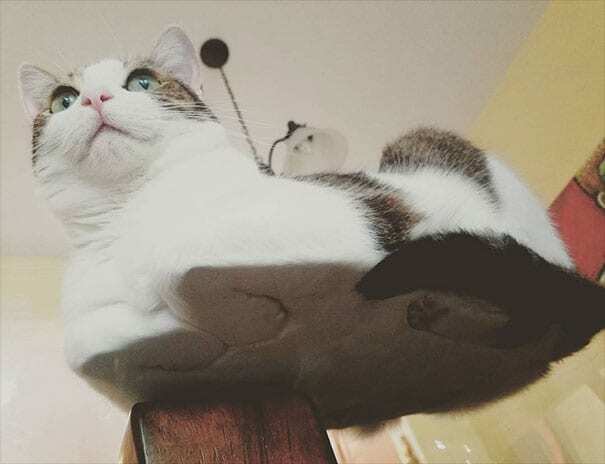 Another great angle of the classic catloaf pose. This one looks just like a loaf of gingerbread. It’s always cool to see how cats fold up their paws and tuck them in like that. 37. Watcha Lookin At, Hooman? Meet Pippa, a super cool British shorthair cat. She is absolutely stunning and perfectly groomed just like the princess she is. Although she is used to the attention, it’s obvious she doesn’t like it that much when people stare at her and take photos. We don’t blame her!